Drs. Domingo and Veneranda (Vennie) Alvear were recently honored with the 2012 Humanitarian Award from United Way of the Capital Region’s (UWCR) Tocqueville Society. They were recognized for their lifetime of inspirational leadership and outstanding commitment to improving lives locally and globally during a special reception, sponsored by M&T Bank and PinnacleHealth. Domingo, chief of pediatric surgery for PinnacleHealth, and Vennie, an anesthesiologist with Riverside Anesthesia Associates Ltd., have woven their talents, intuition and compassion together to create a legacy of serving those in need, frequently the most vulnerable children and babies in our community and impoverished communities around the world. For Domingo, the love of helping others through medicine came early in life while growing up in the Philippines. His uncle, a doctor, would take Domingo along in an old Army jeep to visit patients living in huts along the countryside. Domingo fondly remembers the compassion his uncle showed the ill during the darkest moments of their lives. Perhaps one of the most influential moments in Domingo’s young life, came when his baby sister, Flordeliza arrived prematurely. While the other children in the family were hesitant to hold her, Domingo fed her using an eye-dropper and cared for her with compassion and understanding. Every time Domingo treats a baby in the neonatal intensive care unit (NICU), he remembers caring for his sister decades ago. To date, Domingo has treated more than 10,000 babies and children in the United States and other countries. Domingo and Vennie met in medical school in the Philippines, married and soon moved to the United States. Vennie became a pediatrician and then an anesthesiologist. 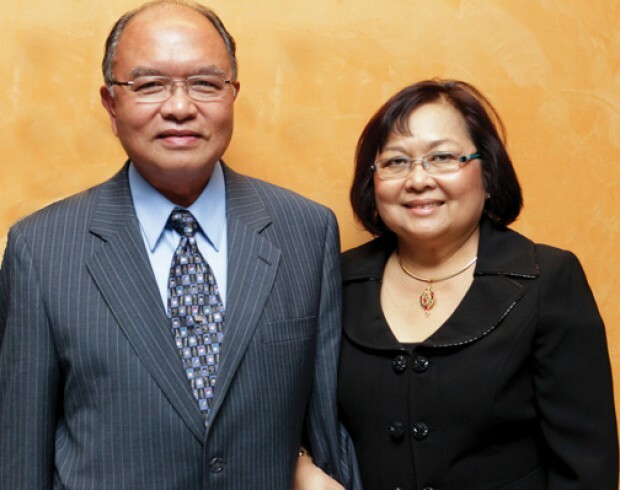 The couple intended to return to the Philippines, but political unrest at the time prevented the move and they eventually moved to Harrisburg, started a family and began contributing to the well being of our community. The couple’s shared commitment to the lives of children and the poor has served as a model for the way medical missions are carried out in Third World countries. After participating in several medical mission trips, the couple noticed the education of professionals in their visiting countries was a valuable, yet missing component, of their missions. This led to the creation of the World Surgical Foundation (WSF) in 1997. WSF creates a comprehensive approach to patient care. They connect medical professionals and volunteers throughout the United States with hospitals in Third World countries. Their leadership has inspired volunteerism across the world and right here in our backyard, and includes not only the medical community, but the broader community. The WSF solicits used hospital equipment and the donation of medical drugs to be used in their “adopted” hospitals. Medical supplies are shipped prior to the mission trip to ensure everything is in place when the physicians arrive. Physicians and volunteers work hand-in-hand with local professionals to teach them how to perform procedures and care for patients long after the WSF team has left the country. The goal of sustainability has created real and tangible results in Ecuador, Ethiopia, Haiti, Honduras, India, Thailand and the Philippines. Surgical visits are held several times a year with an average of 150 surgeries performed during each visit. On November 3, 2012, the WSF held its 15th Annual Crystal Ball Gala to raise funds for future growth of the Foundation. In addition to this event, Domingo and Vennie served as honorary chairs of the 2012 “Star Light, Star Bright – Shine for a Child Tonight” Gala to support PinnacleHealth Children’s Fund. While Domingo has a passion for medical work in Third World countries, the impact of his living legacy can be found right here in the Capital Region. When the couple moved to Harrisburg in July of 1973 there were no NICUs in the area. Thanks to Domingo’s creative approach to helping others, the first NICU opened in Harrisburg in 1978 at the Polyclinic Medical Center and Harrisburg Hospital. Decades later, PinnacleHeath’s NICU cares for nearly 500 babies annually from as young as 23 weeks to full-term infants with complex and medical issues. In addition to his professional accomplishments, Domingo has served as President of the Polyclinic Medical Center, Dauphin County Medical Association, Society of Philippine Surgeons of America, board of the directors of the Pennsylvania Medical Society, Central Penn College and the PinnacleHealth Foundation. He has also served on the medical committees of the March of Dimes and Leukemia Society. He was awarded the Medical Champion by the March of Dimes on October 8, 2012. Domingo and Vennie have taught thousands of people both first-hand and by example how to change and save lives. Dr. Fe Del Mundo a Pediatrician from the Philippines, who will be 100 years old on November 27, 2012, stated “I believe that if you can give the world the best you can, the best will always come back to you. I have done what is mine to do; now it is your turn to do what is yours.” UWCR was pleased to honor Drs. Domingo and Veneranda Alvear with the 2012 Humanitarian Award.